In the Dupont Circle area of Washington DC, Air Canada set up a pop up restaurant featuring what is perhaps the national dish of Canada, poutine. This is a not at all disguised marketing campaign for Air Canada, but the proceeds do go to Martha’s Table. If you are not familiar with poutine, it is a dish made from fries cooked in duck fat and covered in cheese curds and gravy. Deluxe version of it also put shredded duck meat on top. Properly cooked, it is one of the best comfort foods in the world. Being a lover of good poutine, I decided to give it a try. So did everyone else in DC, it turns out. In fact, while I was walking to the restaurant, I heard someone passing bye scoff at people standing in line for French Fries. I corrected him, saying it was poutine, but he did not get the point. He has obviously never had duck fat fries smothered in cheese curds and gravy. All told, I waited in line 35 minutes, placed my order, and waited another 9 minutes for the food to arrive. 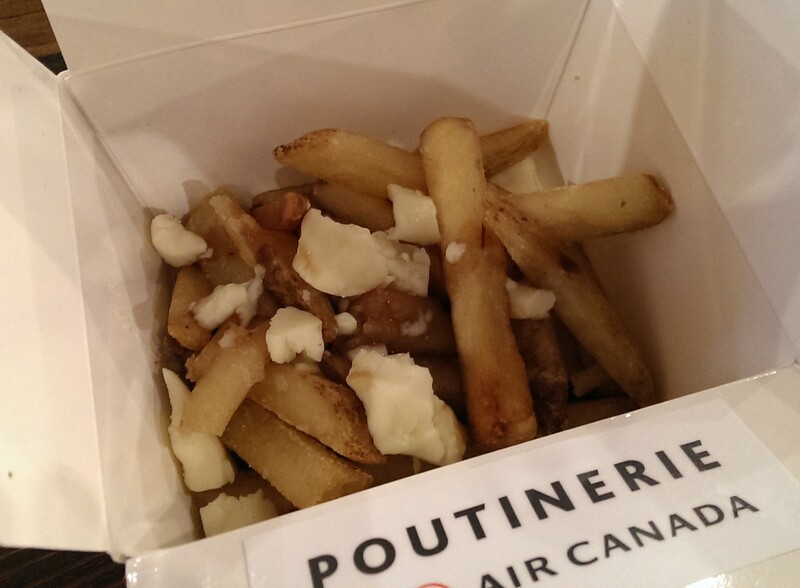 The menu offers a variety of poutine, highlighting the various destinations Air Canada offers service too. I was in the mood for classic poutine, so I ordered that (the “Montreal Classic”). 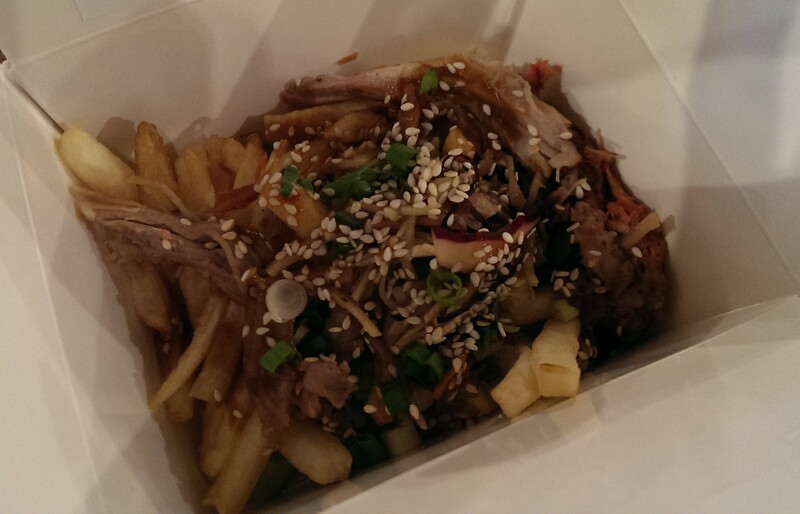 I was also interested in trying one of the boutique poutines, and so I ordered the “Shanghai Neon Street BBQ”. This was fries covered with pulled pork, covered in a hoisin sauce, sesame seeds, and scallions. There were 8 other flavors available. Highlights include London’s Corner Pub Fish and Chips (exactly what it sounds like), Toronto’s The Six (sweet potato fries, pork belly, and a maple mustard sauce), and Mumbai’s Baked and Buttered (featuring buttered chicken). So was it worth the wait? The classic poutine, sadly, was disappointing. There was hardly any cheese curds, and the gravy, while quite delicious, was lacking. And the fries were soggy, and did not taste like they were cooked in duck fat. I’ve had much better poutine elsewhere, even in the states. The Shanghai, however, was fabulous. The pork was delicious and plentiful, and the hoisin sauce and extras accompanied it perfectly. I would definetly get that again. And while I did not get it, I heard great things about hte Mumbai butter chicken. If it were not for the lines, I would definitely go again. The Shanghai is good, and there are several other flavors I would like to try. The Toronto Six heads the list. Overall, I recommend the place, but do suggest avoiding the classic.